These types of shores are only possible of course where the gap between the two buildings is quite small. If they can be used then they do have the advantage of allowing passage under them, whereas raking shore do take up a lot of room. 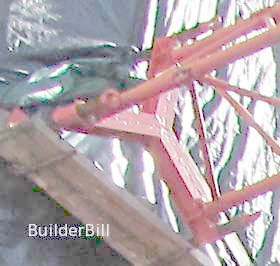 Above is a shot of a building site that has already had the existing building demolished, and the two adjacent building are braced off each other with purpose made triangular steel beams. At the right is a rather poor shot of the end of one of the beams. It can just about be seen that it has a sturdy end to it that has screw jacks fitted to each leg. Both ends of the beam have the same treatment. 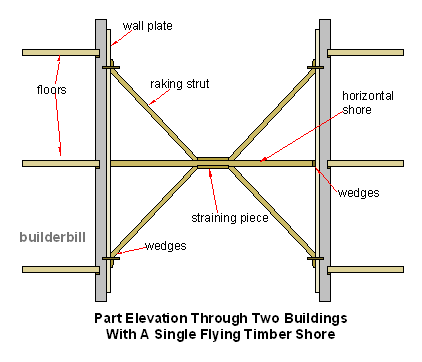 As is normal to all propping and shoring work the end steel plates of the shores are pushing against timber pieces, partly to spread the load but also to give a cushioning effect. NEVER PLACE TEMPORY STEEL PROPS DIRECTLY AGAINST MASONRY OF CONCRETE. They can and they do slip. Note! As in all these shoring examples, the shores are lined up with floors of the building that they are supporting. 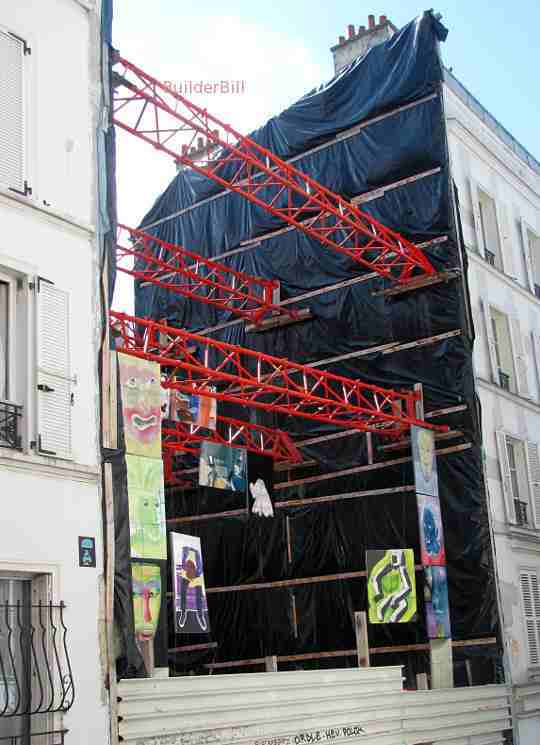 In case you are curious about the stuff hanging off the shoring, the shot was taken in Paris and a nearbye gallery owner or artist has hung a few painting off them.